THE DEBATE over South Asia’s first commercially released genetically modified (GM) crop is unlikely to die down any time soon. A week after anti-GM groups in Bangladesh demanded a ban on the farming and marketing of Bt brinjal citing inadequate research on its impact on the environment and human health, the Bangladesh Agricultural Research Institute (BARI), on September 7, declared plans to expand the cultivation of Bt brinjal. 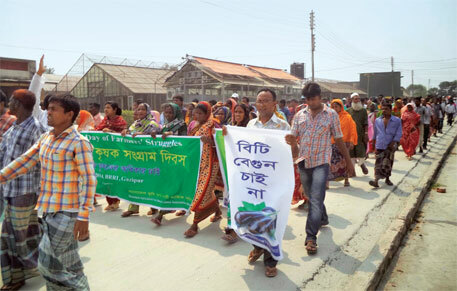 The two camps earlier came face to face at a press meet organised by the Bangladesh Environmental Lawyers’ Association (BELA) in Dhaka on August 31, where BELA and other anti-GM groups, including UBINIG and Bangladesh ParibeshAndolan, denounced the introduction of Bt brinjal. They claimed that hardly five to six farmers who grew the crop had a good harvest. To counter this, BARI brought in as many as 16 farmers from across the country who grew Bt brinjal. It claimed that 11 of them got good yields, while admitting that the remaining nine did not because of problems of bacterial wilt and delay in sowing. The Bangladesh government released Bt brinjal on October 30, 2013, and became the 28th country in the world that grows one or more GM crops. On January 22 this year, BARI handed over saplings of four Bt brinjal varieties to 20 farmers selected from four agro-ecological zones of the country in the first phase of field trials (see ‘Uneasy numbers’). The decision to release Bt brinjal in Bangladesh came even as two other Asian countries—India and the Philippines—having the same GM crop (Bt brinjal) technology ready in hand refrained from doing so because of legal hurdles and public opposition. Eight months after Bangladesh began its Bt brinjal cultivation, the government and anti-GM activists are still locked in a war of words. Neither of the two groups is showing any sign of relenting. Amid the uproar, BARI director-general Mohammad Rafiqul Islam Mondal informed the media on September 7 that the government plans to widen Bt brinjal farming by distributing saplings to another 100 farmers this winter. This is a five-fold increase from the first batch. Farida Akhtar, one of the founders of UBINIG, an organisation that promotes organic farming in Bangladesh, expresses concern over the news. “On what basis is the government expanding GM crops? Has it not seen how poorly Bt brinjal has fared?” she asks, and adds that those who are campaigning against the crop are being branded “collaborators or lackeys” of companies selling pesticides. Bt brinjal: boon or bane? Bt brinjal does not require farmers to spray pesticides as it has been modified to keep fruit and shoot borer (FSB) at bay. FSB is the most destructive insect pest for brinjal in South and Southeast Asia, and FSB infestation renders as much as 70 per cent of the crop unusable. Overdose and improper application of pesticides in brinjal to fight FSB is harmful for consumers too. The farmers present at the press meet had a mixed response to Bt brinjal. While some expressed complete satisfaction in their first experience with the GM crop, others complained of insufficient yields. “Some people used to stalk my field and warned me not to feed Bt brinjal to my children. They also warned me not to sell the brinjal in the market,” says Mansur Ahmed Sarkar, a farmer from Gazipur. Haidul Islam, another farmer, had a bitter experience as all the Bt brinjal plants he had grown wilted ahead of time. Mondal admitted that there was a delay in distributing the saplings and added that BARI would distribute the next round of seeds in time. He alleged that some of the farmers could not take proper care of their fields because of constant threats from anti-GM groups. A few farmers agreed, but refused to take names. Mondal disagrees that Bangladesh’s first encounter with the GM crop has gone awry. “Bt brinjal is not a silver bullet. It is meant to resist FSB. This does not necessarily mean that Bt brinjal will not be susceptible to bacterial wilt or for that matter, certain other vulnerabilities,” he explains. Anti-GM groups like UBINIG are of the view that the government rushed with the introduction of GM crops. Shahjahan, a farmer from the central district of Jamalpur, gave Down To Earth three reasons why he did not get expected yields from Bt brinjal. “They [government] gave us the seeds late in the season [January instead of October-November]; these were kept in very dry conditions prior to distribution; and the variety that I got is not suitable for the type of soil in my field. Had they supplied me Kajla variety instead of Nayantara, it would have grown well,” he says. Shahjahan does not want to count himself in either of the camps in the Bt brinjal debate. “There is no question of compensation for whatever crop losses some of us have suffered. We have already got both financial and material support from the government,” he says. As the debate over the GM crop rages, Shahjahan is willing to try out Bt brinjal one more time provided the government gives him quality seeds/plants at the right time and in the right condition. What's the fuss about Bt brinjal?